You entered a non existing email address. You will receive and email to remind you of your password. The selected AMIGO CARD/ID MEDPLAYA NUMBER or EMAIL is invalid. The information contained in this website is for general information purposes only. The information is provided by Med Playa and while we endeavour to keep the information up to date and correct, we make no representations or warranties of any kind, express or implied, about the completeness, accuracy, reliability, suitability or availability with respect to the website or the information, products, services, or related graphics contained on the website for any purpose. Any reliance you place on such information is therefore strictly at your own risk. Through this website you are able to link to other websites which are not under the control of Med Playa. We have no control over the nature, content and availability of those sites. The inclusion of any links does not necessarily imply a recommendation or endorse the views expressed within them. Every effort is made to keep the website up and running smoothly. However, Med Playa takes no responsibility for, and will not be liable for, the website being temporarily unavailable due to technical issues beyond our control. MED PLAYA aims to respect the privacy of customers and users of its website and social networks and to protect the personal data that may have been provided through any form of contact with our hotel chain. For this reason MED PLAYA has implemented the necessary security measures, both technically and organizationally, required to ensure the security and integrity of the personal data of our customers, thus preventing loss and unauthorized treatment or access in accordance with current legislation in the area of data protection. In this regard, and in accordance with the provisions of Regulation (EU) 2016/679 of the European Parliament (GDPR), below we detail information regarding the processes that MED PLAYA carries out on your data. Registered address: Paseo General Mendoza, nº 1, Planta 6ª, CP 17002, Girona. We process the data obtained in order to manage the registration process and our relationship with the users of our website, to answer and respond to the requests of users through the different contact forms and to administratively manage the contracted service. ONLINE RESERVATIONS: By filling in the online Reservation form, the user accepts and authorizes MED PLAYA MANAGEMENT, SL to automatically use and process the personal data provided for the purposes of administering the requested reservation and to provide the contracted accommodation service. If the user has expressly consented to receive commercial communications by checking the box on the form relating to the receipt of publicity regarding the services and offers made by the MED PLAYA group, their personal data will be further processed to provide them with information regarding our news and offers by email. Similarly, the user is informed that when they make a reservation, their personal data and that relating to the reservation will be passed to the companies that make up the MED PLAYA group which are involved in the management of the reservation and the execution of the same for the purposes previously described. AMIGO CARD: By completing the registration request for the AMIGO CARD programme, the user accepts and authorizes MED PLAYA MANAGEMENT, SL to use and process the personal data provided for the purposes of the customer loyalty programme of the MED PLAYA group, such as the improvement of the commercial relationship with the client and making personalized offers. Similarly, for the proper fulfilment of the programme, your personal data will be transferred to companies of the MED PLAYA group for the purposes described above. The Personal Data that you provide will be processed to identify you as a user of the programme and to give you access to the various features and services that are available to users registered in the programme. The user can, at any time, revoke consent for the processing of their personal data by sending an email to rgpd@medplaya.com. However, the revocation of consent will imply the exclusion of the client from the AMIGO CARD programme. CONTACT FORMS: By filling in the contact and opinion form on the website, the user accepts and authorizes MED PLAYA MANAGEMENT, SL to use and process the personal data provided in order to respond to requests, suggestions and complaints, as well as to improve the quality of service. For the proper attention of and answer to the communication, your personal data may be transferred to companies of the MEDA PLAYA group in order to give the most appropriate response to the request. The user can, at any time, request the cancellation of their personal data by sending an email to rgpd@medplaya.com. NEWSLETTER: When filling in the request to receive the newsletter, the user accepts that his or her email address will be included in a publicity distribution list for the purposes of sending news and commercial communications relating to the MED PLAYA group. Thus, if you authorize your subscription to the MED PLAYA group newsletter, we will provide you with information about our services and news through email, SMS and telephone calls. The user may revoke his or her consent for us to send our commercial communications at any time by sending an email to rgpd@medplaya.com. CURRICULUM VITAE: By completing the CV submission form on our website, the user accepts and authorizes MED PLAYA MANAGEMENT, SL to use and process the personal data provided so that it may be integrated into a personnel selection database with the purpose of being entered into the personnel selection processes for the different hotels and companies belonging to the MED PLAYA group. How have we obtained your personal data and what legitimacy do we have for the processing of your data? The legal basis for the treatment of personal data is the express consent that the person concerned has previously provided, as well as compliance with legal obligations as set forth in Regulation (EU) 2016/679, of the European Parliament and of the Council, of 27th April, 2016, and other legal regulations in force regarding data protection. Therefore, the personal data that we process derives from the person concerned or their legal representative. In no cases are special categories of personal data processed, such as: data that reveals ethnic or racial origin, political opinions, religious or philosophical convictions, union membership data, genetic data, data relating to the health of a natural person. Not providing the requested personal data, or not accepting this data protection policy, means that it will be impossible to subscribe, register, receive information about the services or the exclusion from the Amigo Card programme. In those cases where there is a prior contractual relationship between the parties, the legitimacy for carrying out the administrative, tax, accounting and employer obligations that are necessary under current legislation will be the previous existence of such a business relationship. Personal data will be kept for the period that you have a relationship with us and in all cases for the periods stipulated in the applicable legal provisions and for the time strictly necessary in order to meet possible obligations arising from the processing. In all cases, we will cancel your data when it is no longer necessary or relevant for the purposes for which it was collected after a period of 10 years from the last service contract, provided you have not previously requested the cancellation of the data. The data processed for commercial purposes will be kept until its deletion is requested. The user can revoke the consent for the processing of their personal data at any time by sending an email to rgpd@medplaya.com. Curriculum vitae that are sent to the company will be deleted after a period of 2 years from receipt. No data will be transferred to third parties, except for companies belonging to the MED PLAYA group, to providers that provide services on our behalf and in compliance with any legal obligation. The data passed to companies within the group itself will be transferred with the purpose of being able to share the necessary information for the proper provision of the service. The information that you provide to us through this website, as well as through the application, will be stored on servers owned by MED PLAYA MANAGEMENT, SL. Anyone has the right to obtain confirmation of whether MED PLAYA is processing their personal data. Thus you have the right to obtain confirmation of whether or not we are processing your personal data and, if so, access the same. You can also request that your data be rectified when it is inaccurate or incomplete, as well as request its deletion when, among other reasons, the data is no longer required for the purposes for which it was collected. In addition, in certain circumstances you may request the restriction of the processing of your data or, for reasons relating to your particular situation, you may also oppose the processing of your data. In this case we will stop processing the data, except for legitimate reasons that prevail over those interests and rights or for the establishment, exercise or defence of claims. ACCESS TO YOUR DATA: You will be able to consult the personal data held in MED PLAYA group files. RECTIFICATION OF YOUR DATA: You can modify personal data if it is inaccurate. DELETION OF YOUR DATA: You can request that your personal data be deleted. PORTABILITY OF YOUR DATA: You can ask to receive, in electronic format, all the personal data that you have given us, which is necessary for the contractual relationship with the MED PLAYA group. OPPOSITION TO THE PROCESSING OF YOUR DATA: You may request that your personal data not be processed. RESTRICTION OF PROCESSING: You can request the restriction of processing in the following cases: a) while the accuracy of contested personal data is checked b) when the treatment is unlawful but you object to the deletion of your data c) when the MED PLAYA group does not need to process personal data but you need the same for the exercise or for the defence of claims d) when you have opposed the processing of your personal data. To exercise these rights you must complete the request form accompanied by a copy of your national identity document sending it by email (rgpd@medplaya.com) or to the postal address: Data Protection MED PLAYA, Paseo General Mendoza, nº1, Planta 6ª, CP-17002, Girona. In any case, the user has the right to file a claim with the Spanish Data Protection Agency if he or she considers that any right relating to the protection of his/her personal data has been violated or if he/she considers that the processing of personal data concerning him/her infringes Regulation (EU) 2016/679 of the European Parliament. The taxi rank is located at the exit of the airport. The distance is 33 km and the cost is 48 euros (aprox.) per journey. There may be a supplement for luggage, holidays or night services. The bus stop is located next to the arrivals terminal. There is no direct line from Girona airport to Platja de Aro. To get to Platja d'Aro, you have to take a bus from the Barcelona Bus company to Girona station, and then take another bus from the company Moventis/Sarfa to Platja d'Aro. At Platja d'Aro the bus has 2 stops, one is at the taxi rank and the other at the bus station. The best option is the bus station. From the bus station to the Hotel Monterrey there is 1.5 km distance. Leaving the airport, take the C-25 road towards Sant Feliu de Guíxols- Platja d'Aro. At Cassà de la Selva, take road C-65 towards Sant Feliu de Guíxols-Platja d'Aro. When you arrive to Santa Cristina d'Aro, continue on the C-31 towards Platja d'Aro. Take exit 314 towards GI-662 to town centre. You will enter through Avinguda Castell d'Aro. At the second roundabout, take the first exit on Carrer Juli Garreta, until you reach a roundabout, take the first exit at Avinguda S'Agaró. Continue on Avenida S'Agaró and at the first roundabout take the third exit onto Carrer San Sebastià, turn right onto Calle Onze de Setembre. A few meters, turn right into Pasaje Bolívar. The hotel is on your left. Please view the map above for more details. Renovated in 2016. All our double rooms are decorated in a modern and functional style. The Monterrey Hotel Playa de Aro offers guests rooms with air conditioning and heating, telephone, satellite TV, hairdryer, minibar, bathroom and large balcony. optional safe. Renovated in 2016. All of our family rooms are decorated in a modern and functional style. The Monterrey Hotel Playa de Aro has family rooms with capacity for up to 4 people. The room includes air conditioning and heating, telephone, satellite TV, hairdryer, minibar, bathroom and large balcony, optional safe. The Hotel Monterrey is located in a quiet residential area of Platja d'Aro, offering a laid-back atmosphere and friendly service. The dining room offers a buffet-style service with typical dishes of national and continental cuisine. 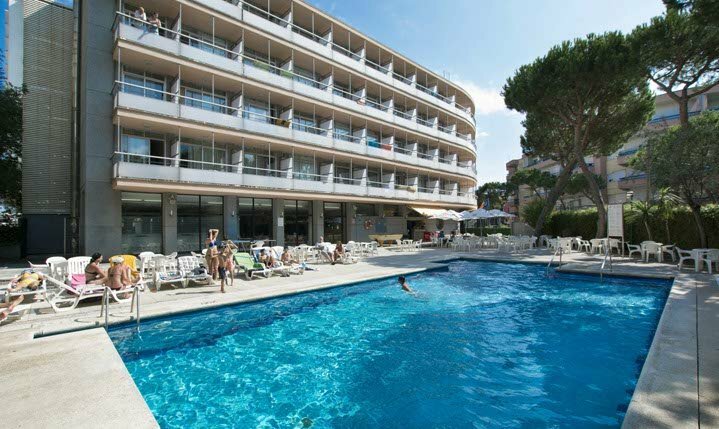 The Hotel Monterrey is located just 75 meters away from the Platja d'Aro beach, one of the the most popular destinations of the Costa Brava. All of the rooms feature private exterior balconies. Free Premium Wifi available throughout the hotel. In Platja d'Aro, located in the heart of the Costa Brava, you will find many options for fun and leisure activities, as well as the opportunity to practice sports such as golf or sailing. You will be able to enjoy restful days at its beaches, such as the Playa Grande (Big Beach), with coarse sand and deep waters, or you can take a dip in one of the many quiet charming coves that you can reach by following the Camino de Ronda (Coastal Path), where you can discover all the amazing views it has to offer. • Access for the disabled. • The hotel has 4 adapted Premium rooms. • Outdoor pool with bar service, sun loungers and sun umbrellas. • Weekly programme of evening entertainment. Live music shows with acrobats, magicians, cabaret etc. • MedKids Entertainment Programme High Season; outdoor and indoor activities for children from 4 to 12 years old. • Television and reading room. • No animals are allowed, except guide dogs. The dining room offers a buffet-style service (renovated 2015 season). You will find a wide variety of national and continental dishes to choose from. • Check-in time: 13:00 p.m.
• Check-out time: 11:00 a.m.
• Right next to hotel. Private, outdoors. Bon hôtel et bonnes prestations pour 3 . Personnel très attentif et serviable à la direction comme à la réception. Nourriture correcte au restaurant pour demi pension. Néanmoins, le restaurant a besoin dêtre boosté au niveau de service comme au niveau dhumeur de certaine serveuses. Muy bueno para mi todo muy bien. Het hotel is goed gelegen, enkele stappen van de zeepromenade en voldoende openbare parkeermogelijkheden. De kamers zijn ruim, hebben een goede en mooie badkamer, airco, koelkastje, tv, ruim balkon. Het enige minpuntje is dat de kast altijd half open staat omdat er bij de vernieuwing bespaard is en er slechts 1 kastdeur geplaatst werd. De kamer is wel mooi ingericht en heeft goede verduisterende gordijnen. Het ontbijtbuffet biedt een uitgebreide keuze. Het middag- en avondbuffet zijn goed maar niet buitengewoon van samenstelling maar alles heeft een heel groot probleem: het warme eten is lauw tot zelfs koud blijkbaar is de keuken niet in staat om warme gerechten op te dienen, ook de opstelling van het warme buffet is hoogst ongelukkig: de warme schotels moeten het hele restaurant door om aan het buffet te komen. Spijtig genoeg was het fruit van het dessert ook niet altijd van onberispelijke kwaliteit aardbeien met plekken, ananas met resten schil. Het personeel is echt vriendelijk en behulpzaam. Ook de kok is vriendelijk maar we hadden liever gezien dat hij voor warme gerechten zorgde dan in het restaurant te paraderen vermoedelijk worden de gerechten ruim op voorhand helemaal klaar gemaakt waardoor de kok tijdens de maaltijden gewoon het buffet hoeft bij te vullen met ondertussen afgekoeld voedsel. Het zwembad is aan de kleine kant - maar het strand is vlakbij. Goed hotel maar jammer van het koude eten. Hotel renovado con gusto y aprovechando muy bien el espacio.se come muy bien a bufet .trato amable y familiar.lqs clientes suelen repetir. Una muy buena relación calidad precio. El trato personal es fantástico. La comida, muy variada y buena. Un tanto alejado del centro, pero a cambio, està a 100 metros de la zona más tranquila de la playa. Mi mujer y yo llevamos años yendo al Monterrey. Cuando los niños se han hecho mayores, seguimos yendo porque estamos como en casa. A seguir en esta línea ! Hotel muy recomendable. Calidad precio inmejorable. Los trabajadores pura simpatía! Hemos disfrutado muchísimo. Volveremos pronto. Hemos repetido por segundo año consecutivo, algo querrá decir! Hemos estado muy bien alojados. Destacamos la simpatía, amabilidad y profesionalidad de todo el personal. La comida muy buena y variada. Y la limpieza en general, de todas las instalaciones. Volveremos, sin duda. Muchas gracias. Need some help from us at Medplaya? Use our Live Chat and we will reply online from our Call Centre when we are open. Or call us on +34 951 989 315. Our Call Centre is open Monday – Saturday. If you are not already an Amigo Card member, we invite you to join and that way you can benefit from our Reward Programme straightaway. It is completely free to be a member and means you will enjoy extra benefits and services when you book with us, or stay with us. MedPlaya is a hotel chain with locations at many of the most popular beach resorts in mainland Spain. We have been looking after guests in our hotels for over four decades , always adapting to changing needs and trends. Our aim is to provide excellent value for money while ensuring that our guests have a great time staying with us.